I once wrote a play. Not only wrote, but directed and produced it, with help from quite a few of my classmates in my Master programme with clothes and props. This took place in 2002-3. It was a one-act play of 40 minutes duration, about W.B. 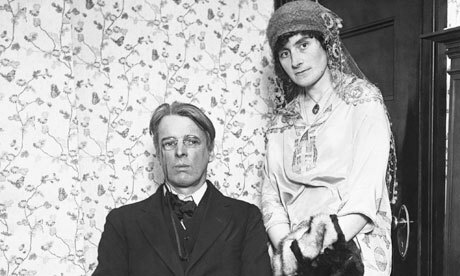 Yeats’s disastrous honeymoon in Kent in 1917, and his new wife’s discovery that on that very occasion he was writing anguished love letters to Maud Gonne’s beautiful, fey daughter Iseult. I could relate very strongly to the bookish, awkward, overlooked Georgie, twenty-four to his fifty-two, and her feelings of rejection and pain when she realised she had been used as a rebound in response to an astrological imperative. “Georgie” she was called before he recast her as “George”, even making her alter her name. She kept him by her side, she diverted his interest by means of automatic writing, and later bore two of his children – but truly she made a bargain with the devil that night on his honeymoon when first she distracted him by grabbing a pen and going into a trance. I had read Yeats’s short play “The Only Jealousy of Emer” based on the myth of Cuchulain’s slumber and his enchantment by the faery queen Fand along with his battlefield relationship with his mistress Eithne Inguba. In order to bring him out of his slumber and back to life, Emer, Cuchulain’s wife, is ordered by a malign fey spirit, Bricriu, to renounce his love and deliver him to Eithne Inguba’s arms. It was a very cruel, pointed message to Georgie indicating exactly what her role would be in his life vis-a-vis Maud and Iseult Gonne. George Yeats met her husband through their shared interest in the Order of the Golden Dawn. She took the secret name Soror Nemo, which in Latin means Sister Nobody. I used that title for my play and the plotline of “The Only Jealousy” on which to base my story. Then I printed out posters for auditions. And it was weird. The first guy who walked in to audition had dark hair with a floppy fringe, wore spectacles, was tall and thin and – basically a dead ringer for Yeats. Not slightly like. The living image. Then I auditioned for Georgie (wife) and Iseult (femme fatale) Bricriu (from “The Only Jealousy”) and a sean-nós singer, who sang the refrain amazingly and put real shivers down my spine. The question my play posed was: what if Georgie had decided not to accept the fate dictated to her and reject the spell? But. I wrote a play. And if nothing else, it shows I had a liking for the period, given what was to happen later!